Explanation: Our solar system's miasma of incandescent plasma, the Sun may look a little scary here. The picture is a composite of 25 images recorded in extreme ultraviolet light by the orbiting Solar Dynamics Observatory between April 16, 2012 and April 15, 2013. The particular wavelength of light, 171 angstroms, shows emission from highly ionized iron atoms in the solar corona at a characteristic temperatures of about 600,000 kelvins (about 1 million degrees F). Girdling both sides of the equator during approach to maximum in the 11-year solar cycle, the solar active regions are laced with bright loops and arcs along magnetic field lines. Of course, a more familiar visible light view would show the bright active regions as groups of dark sunspots. 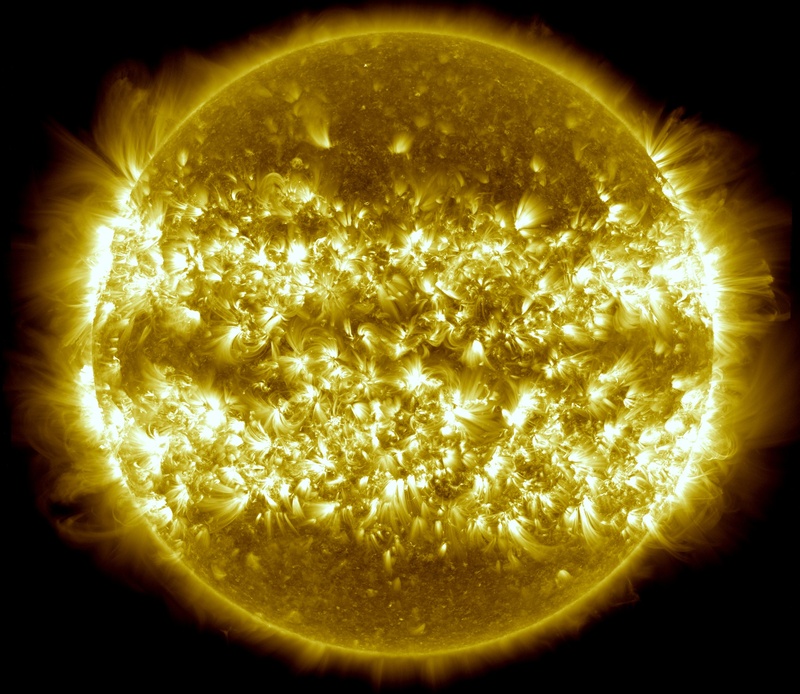 Three years of Solar Dynamics Observatory images are compressed into this short video.